Is effectiveness implemented at the price of bad service? Welcome to yet another Business Excellence Article. I have been travelling a lot over the past couple of weeks and as I have an interest in studying how service is given and how people work together. I have had plenty of time for that with different airlines. One aspect is also how effectively the service is given. Firstly I have noticed that it differs from airline to airline. Secondly I experienced a contrast between service and efficiency. Some airlines are very effective with their service whilst others are not. Take boarding for example. Some have free seating while others have pre-seated the passengers. Some let them board all at once whilst others sort the passengers into different queues at the gate before boarding the aircraft. The way to fill an airplane has been studied by scientists to find the best method. It is supposed to be to fill the plane from back to front, every other row, in two batches, and from the window towards the aisle. I have not noticed any airline that fully uses this science. Maybe because the science does not take into consideration that families travel together and want to board together as well, and also that all passengers are not in place when the boarding starts. To take two examples; Norwegian and South West, which are two very similar airlines. 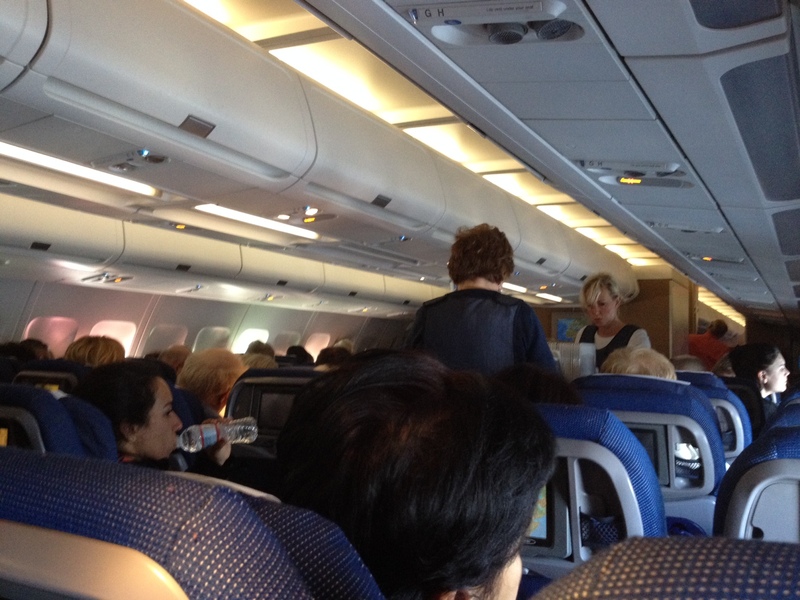 Norwegian has pre-seated everyone, either when they book their trip or when they check-in. They let all passengers board at once. The boarding of a full Boing 737-800 takes about 12 minutes. Some late passengers may arrive after that time, but the main group of passengers is aboard. Southwest has free seating but uses different boarding groups. That means that you get a boarding group on your boarding pass when you check-in. 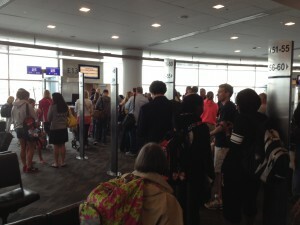 Then they try to get people in a queue by the gate according to their different boarding groups. I use the word ‘try’ as people seem to either not look at their boarding card and/or do not hear what the boarding personnel say. To board a plane, I timed, took about 25 minutes, including the time by the gate to instruct the passengers to get into the right queue by the right time. Whilst Norwegian’s boarding is a quiet event, with a greeting and then everyone boards the plane, Southwest have a lot of announcements to the passengers to get into the right queue and to get out of the way of other passengers. Pre-boarding at Norwegian is taken care of by personnel talking directly to passengers travelling with children or in need of assistance, whilst at Southwest it is done over the loudspeakers. I find Norwegian’s boarding procedure much more effective and at the same time giving me as a passenger a better experience. 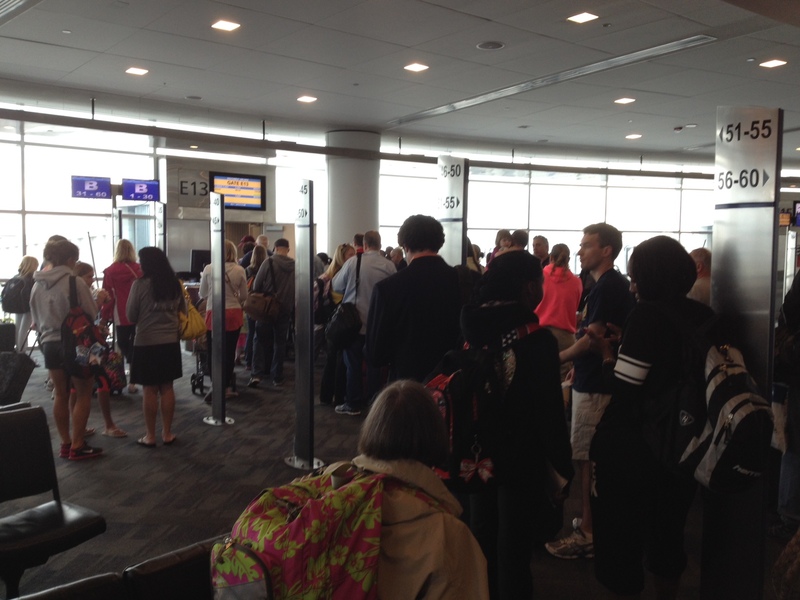 Southwest needs to have several interactions (Moments-of-Truth) with their passengers to get them to board, as they constantly need to direct them to different queues, pre-boarding and more. They even have a video explaining how to board. All that would have been great, if the passengers bothered to view the video and understood the procedure. Consequently there is a lot of explanation to do by the gate personnel. In this case effectiveness and service goes hand-in-hand. Moving on to the onboard service, which is another area that I studied. As with the boarding procedure, some airlines are very effective in providing drinks and food to the passengers, whilst others do not do it as efficiently. Here I see a conflict between service and effectiveness. I see that their effectiveness does have a price, the price of not so good service. They are very fast at shuffling the trays and serving the drinks to the passengers and in reverse – taking them away, but the way that they do it is not in the style of good service. It seems like when they want to be very efficient it also spreads a feeling of rushing within the cabin. Shuffling past at speed with the trolley of food, quick service – tea or coffee and then fast removal of the trays and the trolley. If you are asleep you may miss the refreshments, if you are concentrating too much on eating then you miss the tea and coffee run and if you have not finished when they wish to collect the trays then you will have to sit there with it on your tray table for a long time. Here I find it most important to have more focus on the service than on the efficiency. To be efficient you only go through the cabin once and collect the rubbish, but in reality you have to adapt to the different passengers’ requirements. Some are quick and want to continue to read or work, others see the snack or meal as a nice part of the journey. How can my studies help you in your business then? I would like to give three pieces of advice. Understand the wishes of the customer, so that you are able to adapt to their needs later on. If the customer’s wish and your wish is the same, then go for it. If the customer experience is in contrast to your need for efficiency, then the customer trumps. First them, then you. The efficiency and the cost reduction must not have a negative effect on the customer. You have to find other ways to make those improvements, where it does not impact on the customer experience in a negative way. To be able to live up to the above, you need to truly understand your business and the value that you create for your customers, and who your customers really are and what they both want and need.